If everything goes as planned, we’ll be sending our oldest off to college in less than 10 months. We’re currently knee deep in the college application process, so college (an all of the expenses that go along with it!) are forefront in our minds. That wasn’t the case 10 years ago. In 2003, college seemed like a life time away (which it was, really). But here we are, in 2013, planning to send our oldest away to school. Did you know that according to the College Board, a “moderate” college budget for an in-state college for the 2012-2013 school year averages right at $22,261. Planning on sending your kids to a private university? Nudge that number up to $43,289. That’s per year. College tuitions have been increasing steadily (more than a 500% increase since 1985!) with no signs of slowing down. And they’re rising faster than wages – another scary thought. 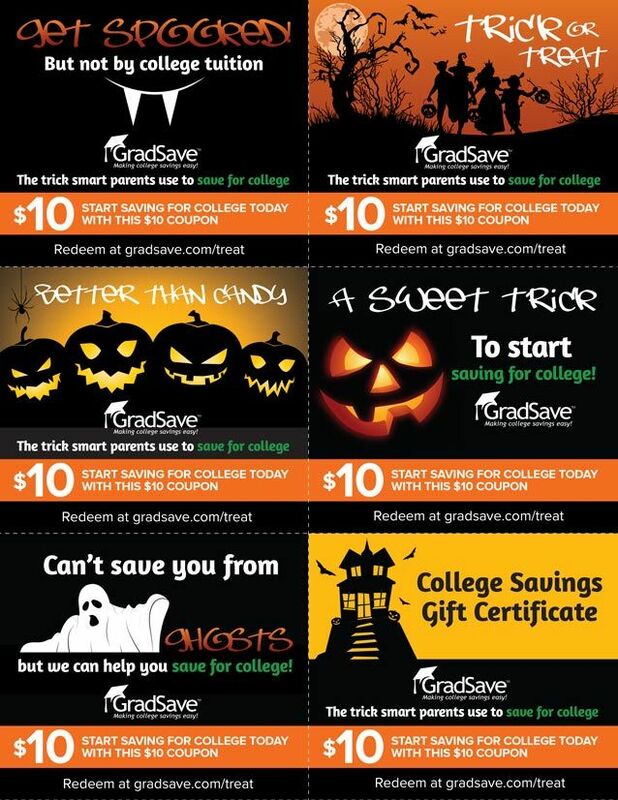 Get spooked…but NOT by college tuition! Gradsave is a web app that helps parents crowdfund their child’s 529 savings account amongst family and friends. So on birthdays and holidays and other special occasions, friends and family can donate towards a child’s college tuition instead of spending money on another toy or blanket or clothes that they will grow out of or break or lose. Donations can be one time or recurring (maybe grandma wants to give $10 a month). And, best of all, Gradsave is free to use. Print out these free trick-or-treat printables from Gradsave to hand out this Halloween…they’ll be one treat that parents will be sure to hold onto. Click to save this image to your computer and then print off (on cardstock!) for a handy Halloween “extra” for parents! Note: This post is not compensated in any way. Just something I felt was worthy of passing on!